It was a fine Saturday in the month of June that I got a chance to attend a product launch event at the Four Seasons , Worli. The product to be launched had too many precursor activities in form of clues and hints. We were send day wise products that had some relation with the product that was to be launched. They had send a card with a man's sketch with his nose clipped, a mask , a small sack with beans and so on. The actual product was handed on the last day. It was fun and intriguing! Of course I loved it. Who wouldn't want to step into a detective's shoes. I along with a select group of handpicked bloggers across Mumbai were chosen to take part in the event. A well known Bollywood Superstar was supposed to grace the event. 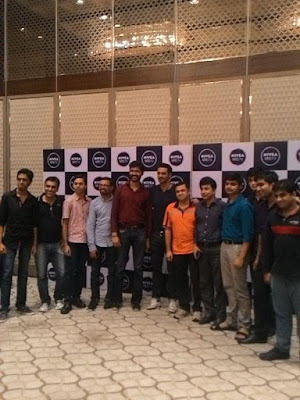 The product was none other than the new Nivea Men Deodizer and the Bollywood superstar was Arjun Rampal. Before he entered we had some fun activity conducted by EI coach and a behavioral trainer - Animesh Gupta. He was a talented man who had lots and loads of new things on his knowledge sack. So he was introduced to us by a pretty lady who also happened to be the host for the event. By then the bloggers had already settled. 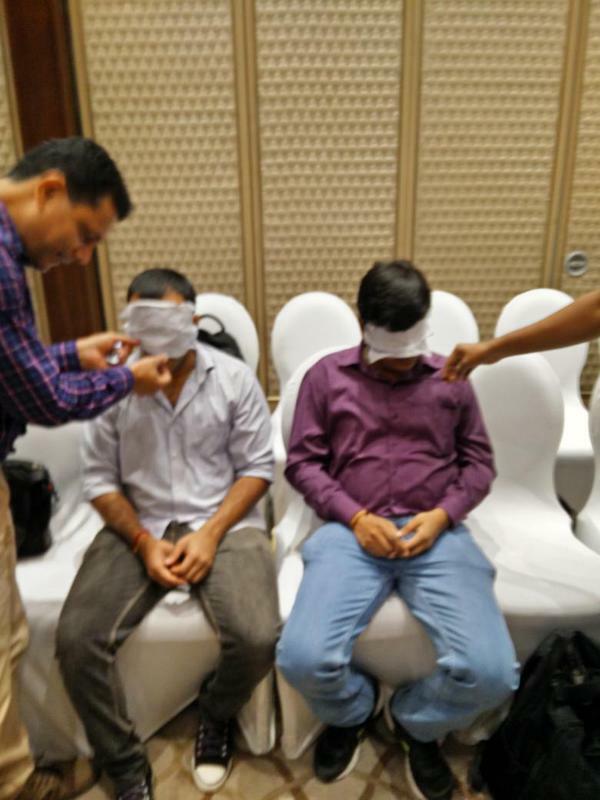 Animesh divided us into 5 groups and chose two of them in the group to be blindfolded. The rest others from the group would place an item before the blinded participant and they have to guess whats that smell and describe the personality. It was indeed a fun activity! As usual , I was the scrape goat here was well and I had to wear the blindfold on my eyes. I tried guessing few correct ones but I wasn't sure if that was even close to it. We discussed about body odours and Animesh gave some really good tips on how can we improve ourself and our personality by grooming ourself in a better way. In short, shoo the bad odour! There were many discussion items such as - Why the body develops bad odour? Its reasons? Effects of day to day things and foods on humans that could produce foul odour and so on. The most important topic was how to identify and confront a person with a bad odour. And how can we tell someone if they smell bad without hurting them. Of course, that's a pretty sensitive topic and no one would really want to do a Michael Jackson on someone's nerve! No, at least I can't. But sometimes you have to! Bad body odour is natural and its our body's mechanism . So its a cycle and we need to do something to prevent it. Participants asked him different kinds of questions on how to apply the deodorant and all. Sooner, the Bollywood Hunk arrived, sporting a different hairstyle and a casual look. He shared his experiences about bad odours and what all he did to overcome it. Of course he is also the brand ambassador of Nivea Men. He spoke about how Nivea products helped him in the long run and how satisfied he was being associated with Nivea! During the discussion with Mr. Rampal , Super blogger Sanjay Thampy asked him on his reaction if he confronts someone who says him that he smells really bad. He stood there for a moment and with a smile he said - Say thank you! Of course, you really got to thank someone when they say something that should be taken up as a genuine feedback and not as an offence item! We then head for a sumptous meal and went back to the room where the Press conference was organized. The launch event was to be held at the same venue. It was festooned with the Nivea Men banners and it looked grand. 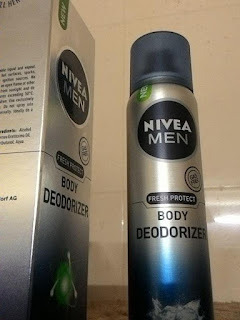 The host invited the M.D of Nivea to unveil the mysterious product and it turned out to be the Nivea Men Deodizer. Many of us by then had already guessed it. The Bollywood hunk stood next to the Magnificent Nivea Deodizer cut out and he kissed it. Prior to this they screened a hilarious spoof on Arnab played by Suresh Menon on a topic related to Ban Odour. It was then followed by a Q & A session with the media personnel's who represented the different media. We then headed for tea and we were given a goodie bag that contained the new Nivea Men Deodizer! Even i use Nivea deodrant from a long time and it really lasts.